Plastic is our daily bread. No, we’re not a fish at sea. But we are working – just like you – in this industry, which is currently being pilloried worldwide. In the course of this hunt, we notice in bewilderment the discussion on banning small and very small plastic parts, which the EU Commission has kicked off with petty actionism. Instead of reaching for the stars, Brussels clings to straws and cotton swabs. It is, of course, clear to everyone that the banishment of such plastic parts does not solve the problem. Such actions are eye washing and hinder the development of sustainable solutions, as they obscure the real cause: The problem is not the plastic part, but the hand that drops it. In this part of the world, this often happens out of laziness, because the way to the next dustbin is “so far away”. However, billions of people worldwide have no access to a functioning infrastructure for waste collection and recycling. 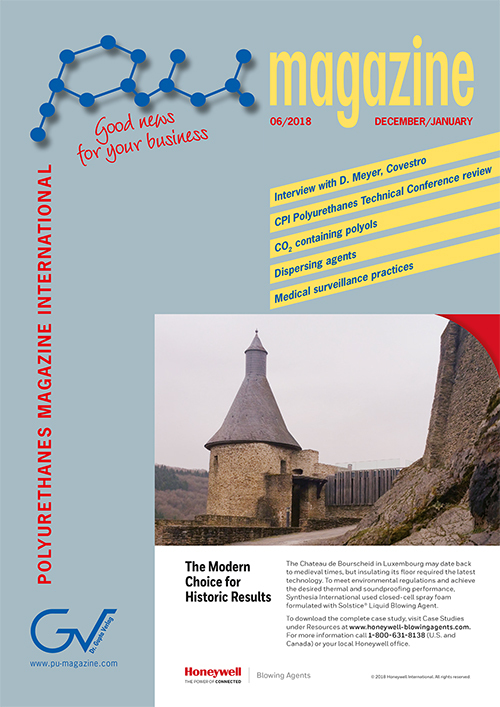 The PU industry takes this subject already very serious and many sustainable solutions are being worked on in all areas along the value chain: this starts with a more sustainable production using less energy and an ever greater proportion of bio-based and sustainably produced raw materials, and includes also products that aid the reduction of energy (e.g., spray foam insulation). The enormous durability of many high-tech products reduces the carbon footprint, and digitalisation and innovative technologies further reduce material waste e.g., nesting technologies during foam cutting, and new 3D bonding techniques during shoe production. We report on many of these topics in the current and upcoming issues. Of course, sustainability of a product is determined by its whole life cycle and should also include social aspects. But from many discussions that we had with industry experts over the past months we are positive that closing the circle is on the brink. At Fakuma 2018, the Sonderhoff Group will focus on the Formed-In-Place Closed-Cell (FIP CC) technology successfully introduced into the market last year. The highlight of the physical foaming process is that already at the metering stage, the closed-cell foam is stable in almost complete sealing dimension applied to the part contour. According to the company, FIP CC technology is therefore particularly suitable for 3D applications and process-oriented quality control. In 2016, the Japanese International Polyurethane Technology Foundation (IPTPF), supported by Inoac Corporation, provided two research grants to Prof. Yoshihiro Yamashita from the Department of Apparel and Fashion Design at Osaka Seikei College and Prof. Hiroto Murakami from the Graduate School of Engineering at Nagasaki University. 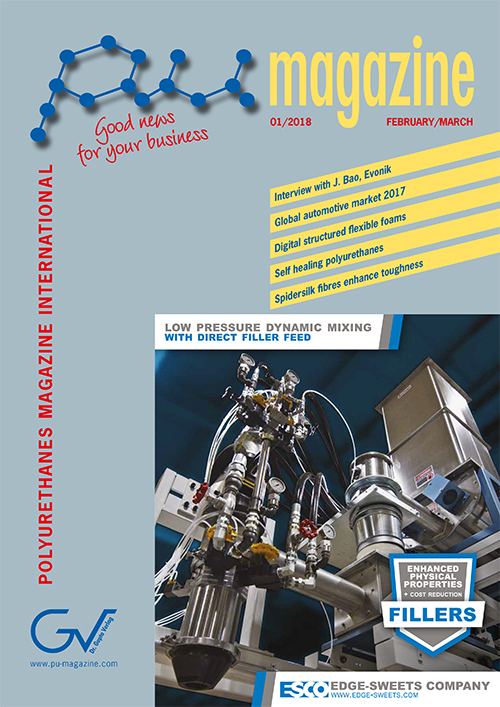 According to the Italian plastics and rubber processing machinery and moulds manufacturers’ association Amaplast, based on foreign trade data published by the Istituto Nazionale di Statistica (ISTAT), Italian imports of plastics and rubber processing machinery racked up a 23 % increase in the first half of 2018 compared to the same period in 2017 – a clear contrast to the weak development of exports. Despite a decline of 7 %, the trade balance has remained positive by over EUR 1 billion. The growth in imports may be interpreted as renewed faith in the domestic market, mainly due to investment incentives that are likely to be renewed, said Amaplast. 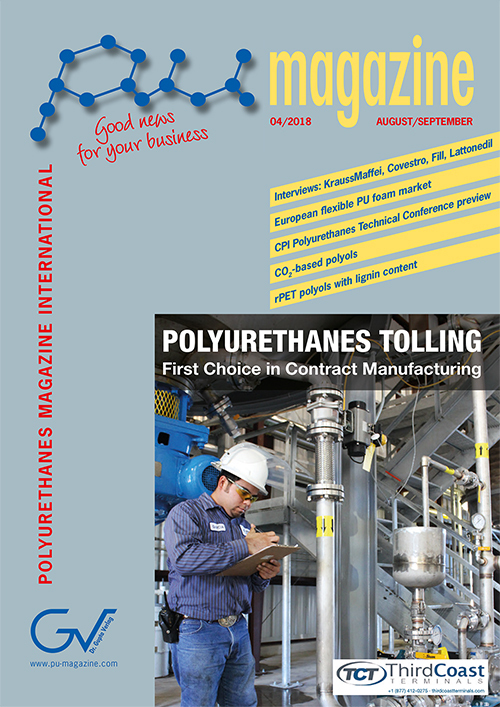 Polyurethane (PU) resin systems open up new applications and markets for pultrusion and help to improve the performance of the process. Efficient process technology ready for mass production is now available for processing them. Fast-curing, UV and weathering-­resistant resin systems have good chances, for instance. A new bio-based matrix system is also very promising. Among other things, it is suitable for the pultrusion of bio-based slats for the reinforcement of load-bearing wooden structures. Low-pressure, two-component polyurethane spray foam products can be used to seal gaps in the building envelope and insulate wall cavities, rim and band joists, and other cavities in the building. While these products have a strong value proposition in reducing greenhouse gas emissions and saving energy through their use in residential and commercial buildings, they are primarily formulated with hydrofluorocarbons, which are considered potent greenhouse gasses. 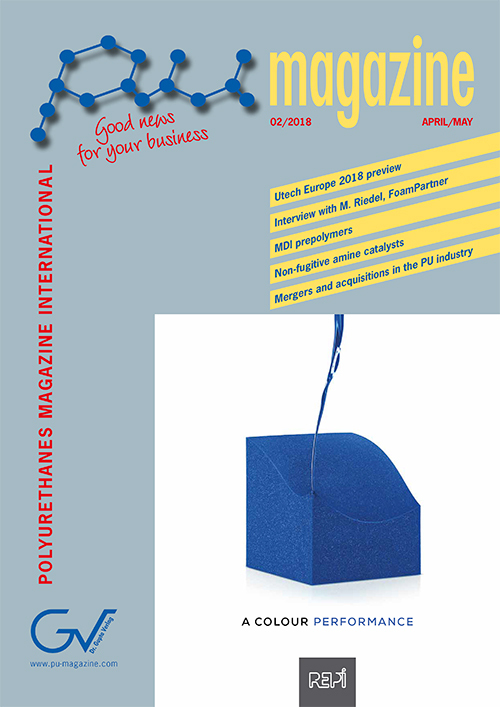 The transition of low-pressure, two-component polyurethane spray foams to new low global warming potential blowing agents, hydrofluoroolefins (HFOs), is challenging because of the poor stability of many polyurethane catalysts with HFOs. Semi-continuous parallel pressure reactor (ScPPR) can be used as a method to screen several catalysts for stability with HFO. 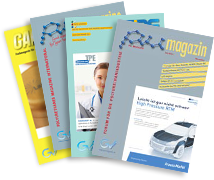 Specifically, the challenges associated with catalyzing the trimerization reaction, an important reaction for these products, are discussed here. Polycarbonate and polyurethane scraps from end-of-life vehicles were converted into liquid recycled polyols with a hydroxyl number around 300 mg KOH/g by using medium chain glycerides of coconut oil. The obtained polyols were used for preparation of low-density rigid polyurethane foams. 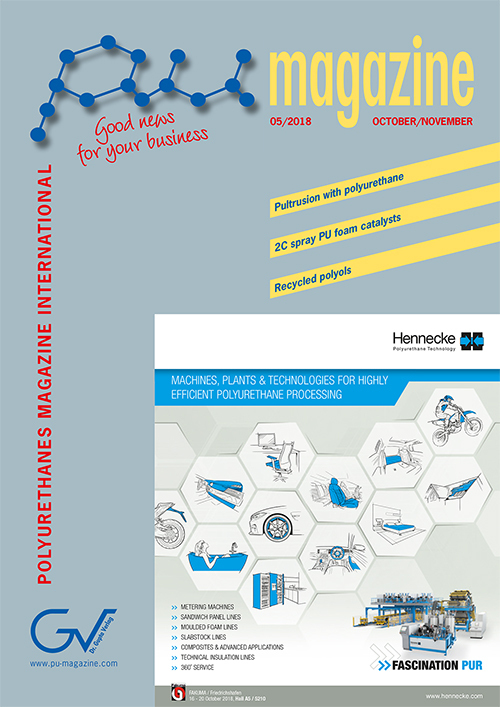 It was found that up to 50 wt% of the virgin petrochemical polyol can be replaced by the recycled polyols without any negative effect on the foaming process. The obtained foams exhibited the apparent density of 40 – 44 kg/m3, the homogeneous cellular structure with a high content of closed cells (>91 vol %) and the beneficially low value of lambda coefficient (~23 mW/mK). 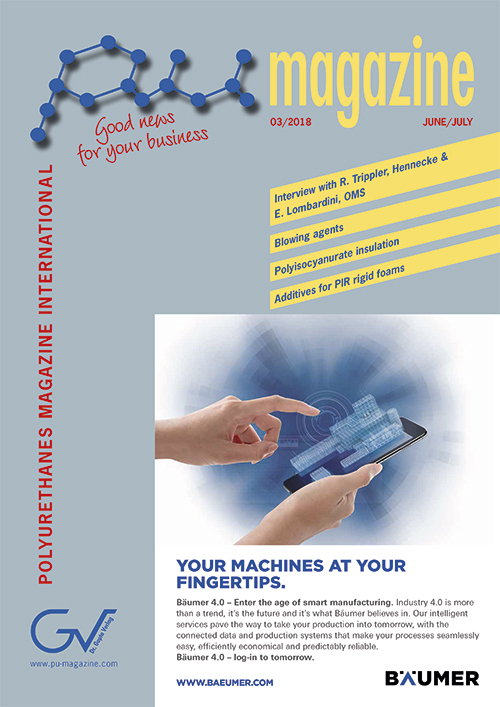 The exceptionally high compressive strength (>350 kPa in parallel to foam rise direction) of the rigid polyurethane foams with 50 wt% of recycled polyol derived from polycarbonate scrap resulted probably from the unique structure of recycled polyol combining rigid aromatic segments together with flexible coconut oil glyceride units. In conclusion, this approach utilizing the renewable coconut oil-derived reagent provides a sustainable recycling solution for two major plastics from automotive waste.